People hoping for a government that works better can’t decide whether to cheer or lament a bipartisan budget bill that legislative leaders call a breakthrough even as they acknowledge it does little. In an era of low expectations, House passage of the bill marks a rare cease-fire that should avoid a repeat of this fall’s government shutdown and flirtation with default. Yet it comes nowhere near the more ambitious efforts to address long-term spending and debt. Such comprehensive plans repeatedly collapsed in recent years despite secret White House talks, blue-ribbon panels, a congressional “supercommittee” and other devices and tactics. Several Washington insiders warn against assuming the new budget deal will lead to progress on immigration and other stalemated issues. “Grand bargain” refers to a bipartisan accord that would start to slow the long-term cost projections of Social Security and Medicare while raising tax revenues to lower the deficit, among other things. The bill that passed the House on Thursday, and awaits Senate action, is a tiny step forward, Bixby said. “But you can’t get that excited if your kid brings home a D because it wasn’t an F,” he said. Some lawmakers see the glass half full. They hope the budget deal will cool partisan passions in 2014 and beyond. One possible area of renewed effort is a proposed immigration overhaul. The Democratic-run Senate passed a version this year, but the Republican-controlled House has stalled it. Advocates talk of a possible piecemeal House approach. But Democrats and Republicans are divided on whether millions of immigrants living in the U.S. illegally should be given a path to citizenship. Some influential lawmakers say the budget deal doesn’t necessarily brighten prospects elsewhere. Sentiments like that suggest Washington may return quickly to divisive issues, most prominently President Barack Obama’s health law, which Republicans bitterly oppose. 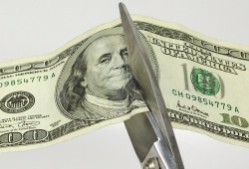 The budget deal eases a harsh set of spending cuts scheduled for 2014 and 2015. But it leaves intact most of the roughly $1 trillion in automatic cuts set to hit the military, domestic agencies and Medicare providers through 2021. Replacing the cuts would be new money from, among other things, higher airline security fees, reductions in pension benefits for working-age military retirees, and higher pension costs for employers and new federal workers hired after the end of this year. The deal does little to dent the nation’s $17 trillion debt. It is meant instead to halt a pattern of lunging from one financial crisis to the next because of Congress’ growing inclination to resist compromise, a trend quickened by the tea party’s rise in 2009. Former Sen. Alan K. Simpson, R-Wyo., said the budget deal is better than nothing. But “it’s a sparrow belch in the midst of a typhoon” that represents long-term fiscal challenges, he said. Simpson co-wrote a major deficit-reduction plan that Obama commissioned, and then largely ignored, and he remains active in the debate. That applies to Congress and the president, Simpson said. The trust fund that supports Social Security is projected to run out of money in 2033. At that point, the retirement and disability program would collect only enough in payroll taxes to pay about 75 percent of benefits. Social Security, Medicare and Medicaid consume 44 percent of federal spending, and they are growing. Far from addressing those popular, tough-to-curtail programs, lawmakers and outside groups are proving how hard it is to achieve even tiny compromises such as the budget deal awaiting Senate action. Many of the House’s most conservative and most liberal members opposed the bill. Tea party groups and others on the right are calling Republicans who back it traitors to conservatism. Liberals say the bill short-changes the unemployed. Nonetheless, the measure drew a hefty majority in the House. That pattern of support from the middle will be harder to win for more ambitious bills that would raise taxes or make meaningful changes to Social Security and Medicare.